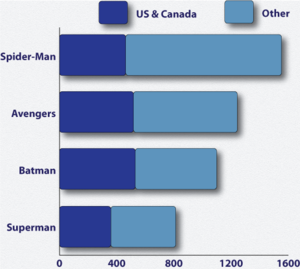 Spider-Man is one of the most popular and commercially successful superheroes. As Marvel's flagship character and company mascot, he has appeared in countless forms of media, including several animated and live action television series, syndicated newspaper comic strips, and in a series of films. 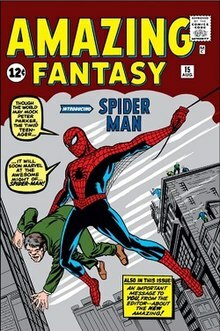 The character was first portrayed in live action by Danny Seagren in Spidey Super Stories, a The Electric Company skit which ran from 1974 to 1977. In films, Spider-Man has been portrayed by actors Tobey Maguire, Andrew Garfield, and Tom Holland. Reeve Carney starred as Spider-Man in the 2010 Broadway musical Spider-Man: Turn Off the Dark. 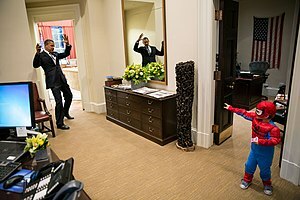 Spider-Man has been well received as a superhero and comic book character, and he is often ranked as one of the most popular and iconic comic book characters of all time. 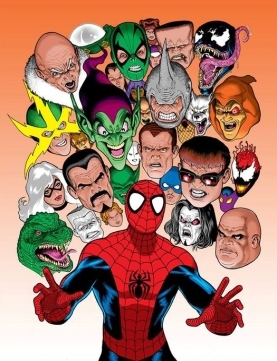 Within the Marvel Universe there exists a multiverse with many variations of Spider-Men. An early character included in the 1980s is the fictional anthropomorphic funny animal parody of Spider-Man in pig form named Spider-Ham (Peter Porker). Many imprints of Spider-Men were created like the futuristic version of Spider-Man in Marvel 2099 named Miguel O'Hara. 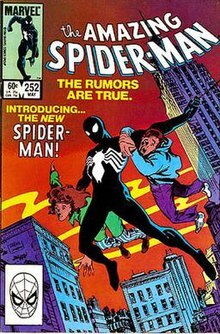 In Marvel Comics 2 imprint, Peter marries Mary Jane and has a daughter named Mayday Parker who carries on Spider-Man's legacy and Marvel Noir has a 1930s version of Peter Parker. 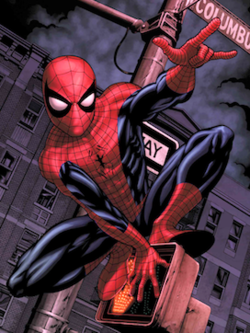 Other themed versions exist within the early 2000s such as a Marvel Mangaverse version and an Indian version from Spider-Man: India named Pavitr Prabhakar. ^ Ditko, Steve (2000). Roy Thomas, ed. Alter Ego: The Comic Book Artist Collection. TwoMorrows Publishing. ISBN 1-893905-06-3. "'Stan said a new Marvel hero would be introduced in #15 [of what became titled Amazing Fantasy]. He would be called Spider-Man. Jack would do the penciling and I was to ink the character.' At this point still, Stan said Spider-Man would be a teenager with a magic ring which could transform him into an adult hero—Spider-Man. I said it sounded like the Fly, which Joe Simon had done for Archie Comics. Stan called Jack about it but I don't know what was discussed. I never talked to Jack about Spider-Man... Later, at some point, I was given the job of drawing Spider-Man'". ^ a b c DeFalco, Tom; Lee, Stan (2001). O'Neill, Cynthia, ed. Spider-Man: The Ultimate Guide. New York: Dorling Kindersley. ISBN 0-7894-7946-X. ^ a b Ditko, Steve (2000). Roy Thomas, ed. Alter Ego: The Comic Book Artist Collection. 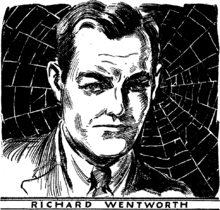 TwoMorrows Publishing. ISBN 1-893905-06-3. ^ Manning, Matthew K. (2012). "1970s". In Gilbert, Laura. Spider-Man Chronicle Celebrating 50 Years of Web-Slinging. Dorling Kindersley. p. 60. ISBN 978-0756692360. ^ Manning, Matthew K. (2012). "1980s". In Gilbert, Laura. Spider-Man Chronicle Celebrating 50 Years of Web-Slinging. Dorling Kindersley. p. 147. ISBN 978-0756692360. ^ Cowsill, Alan (2012). "1990s". In Gilbert, Laura. Spider-Man Chronicle Celebrating 50 Years of Web-Slinging. Dorling Kindersley. p. 184. ISBN 978-0756692360. ^ Manning, Matthew K. (2012). "1970s". In Gilbert, Laura. Spider-Man Chronicle Celebrating 50 Years of Web-Slinging. Dorling Kindersley. ISBN 978-0756692360. ^ a b c DeFalco, Tom (2008). "1960s". In Gilbert, Laura. Marvel Chronicle A Year by Year History. Dorling Kindersley. p. 87. ISBN 978-0756641238. ^ a b c Manning, Matthew K. (2012). "1960s". In Gilbert, Laura. Spider-Man Chronicle Celebrating 50 Years of Web-Slinging. Dorling Kindersley. p. 20. ISBN 978-0756692360. ^ a b Manning, Matthew K. (2012). "1960s". In Gilbert, Laura. Spider-Man Chronicle Celebrating 50 Years of Web-Slinging. Dorling Kindersley. p. 24. ISBN 978-0756692360. ^ a b Manning, Matthew K. (2012). "1960s". In Gilbert, Laura. Spider-Man Chronicle Celebrating 50 Years of Web-Slinging. Dorling Kindersley. p. 25. ISBN 978-0756692360. ^ a b c d e Manning, Matthew K. (2012). "1960s". In Gilbert, Laura. Spider-Man Chronicle Celebrating 50 Years of Web-Slinging. Dorling Kindersley. p. 26. ISBN 978-0756692360. ^ a b Manning, Matthew K. (2012). "1960s". In Gilbert, Laura. Spider-Man Chronicle Celebrating 50 Years of Web-Slinging. Dorling Kindersley. p. 27. ISBN 978-0756692360. ^ a b Manning, Matthew K. (2012). "1960s". In Gilbert, Laura. Spider-Man Chronicle Celebrating 50 Years of Web-Slinging. Dorling Kindersley. p. 28. ISBN 978-0756692360. ^ a b Manning, Matthew K. (2012). "1960s". In Gilbert, Laura. Spider-Man Chronicle Celebrating 50 Years of Web-Slinging. Dorling Kindersley. p. 36. ISBN 978-0756692360. ^ a b Manning, Matthew K. (2012). "1960s". In Gilbert, Laura. Spider-Man Chronicle Celebrating 50 Years of Web-Slinging. Dorling Kindersley. p. 38. ISBN 978-0756692360. ^ a b Manning, Matthew K. (2012). "1960s". In Gilbert, Laura. Spider-Man Chronicle Celebrating 50 Years of Web-Slinging. Dorling Kindersley. p. 40. ISBN 978-0756692360. ^ a b Manning, Matthew K. (2012). "1970s". In Gilbert, Laura. Spider-Man Chronicle Celebrating 50 Years of Web-Slinging. Dorling Kindersley. p. 59. ISBN 978-0756692360. ^ a b c d Manning, Matthew K. (2012). "1970s". In Gilbert, Laura. Spider-Man Chronicle Celebrating 50 Years of Web-Slinging. Dorling Kindersley. p. 72. ISBN 978-0756692360. ^ Yehl, Joshua; Schedeen, Jesse. "Top 25 Spider-Man Villains: Part 1". IGN. Retrieved 12 December 2016. ^ Manning, Matthew K. (2012). "1980s". In Gilbert, Laura. Spider-Man Chronicle Celebrating 50 Years of Web-Slinging. Dorling Kindersley. p. 118. ISBN 978-0756692360. ^ "AMAZING SPIDER-MAN (1963) #212". Marvel. Retrieved 27 April 2015. ^ a b Cowsill, Alan (2012). "1990s". In Gilbert, Laura. Spider-Man Chronicle Celebrating 50 Years of Web-Slinging. Dorling Kindersley. p. 197. ISBN 978-0756692360. ^ a b c Whitbrook, James. "The Greatest Spider-Men of All Time, Ranked". io9. Retrieved 30 December 2017. ^ "Top 10 Oddest Marvel Characters". Time. 2009-09-03. Retrieved 2010-03-04. ^ a b "10 Best SPIDER-MEN Of All Time". Newsarama. Retrieved 30 December 2017. ^ Ong, Benjamin; Kean Pang (16 July 2008). "Remembering When West Has Met East". Newsarama. Retrieved 26 July 2015. This page was last edited on 19 April 2019, at 19:08 (UTC).